Evil Dead News - News Related To The Evil Dead Franchise: Evil Dead 2 Kandarian Dagger Prop, Sculpted by Tom Sullivan - Pre-Order Now! 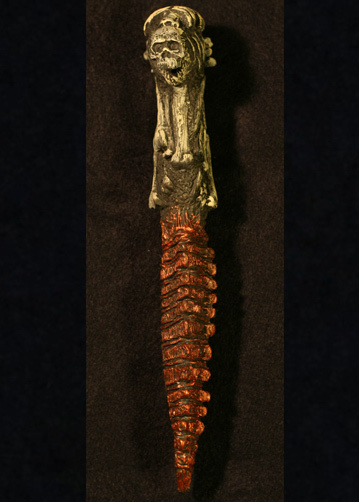 Evil Dead 2 Kandarian Dagger Prop, Sculpted by Tom Sullivan - Pre-Order Now! 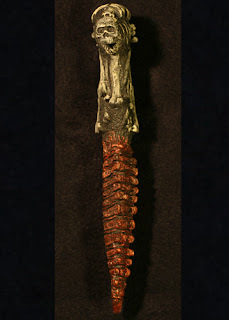 Trick or Treat Studios is proud to bring you the Official Kandarian Dagger Prop! This amazing Prop was sculpted by Tom Sullivan, the actual FX Artist that made the Kandarian Dagger for Evil Dead 1 and 2! Cast in high quality Polyurethane the Dagger has a solid feel and look as if it came right off the screen. The Kandarian Dagger is the perfect compliment for your Witch Costume or Zombie Costume this Halloween! The size of the Dagger is approximately 36" long, exactly the size of the actual dagger from the movies.